Asia is a great vacation destination but a trip to the East can easily be ruined if you don’t plan ahead for weather. In a region dominated by varied weather, rainy seasons and dry seasons, it’s important to plan for the climate and understand how different seasons will impact the price and enjoyment of your vacation. If you visit a nation such as Thailand during the rainy season you simply aren’t going to be able to do everything you want and spend time outside every day of the week. In Thailand, the rainy season is basically May to October and during that time the weather fluctuates between heavy downpours and clear skies. You may have perfectly clear days in which to tour outdoor attractions but your plans can be easily interrupted by a heavy downpour that comes on without warning. If you’re trying to save money, traveling to an Asian nation during its rainy season will cut down on costs. Because most people don’t want to travel during the monsoon, hotels and tours will cost less during the rainy season. Equally, sites and accommodations will be much less crowded so if the presence of lots of people is something you want to avoid, plan to visit a country during its rainy season. Remember too that the climate will vary between the regions of whatever country you are in. For instance, Southern Vietnam is still fairly temperate during the rainy season but the North can be much wetter. Take this variance into account when traveling and if the region you’re in looks like it will be miserable for a week, travel somewhere else. You really don’t even need to leave a country to find more amenable weather. Flexibility is important when visiting a nation during its rainy season. If you’re a rigid traveler then this isn’t the season for you to be in Asia but if you’re willing to go with the flow, change your plans based on the forecast and are interested in seeing lots of indoor as well as outdoor sites during your Asian trip, this could be the season for you. Remember also that even though the whole season is identified as rainy, certain months are worse than others. Look at monthly precipitation before you travel during the rainy season and identify which months would be tolerable and which would not. On balance, the rainy season is a good time for the cost conscious traveler to visit Asia. 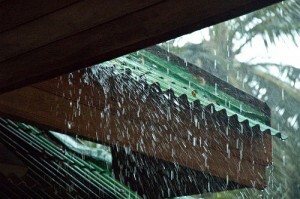 It’s not a season of constant torrential downpours but this image keeps a lot of tourists out of the region. Use this to your advantage by getting better deals on everything from hotels to transportation to tours. And while you’re saving money you’ll also be enjoying a quieter, less crowded trip as many tourists who haven’t done their research will be staying home out of fear of vast rainstorms and flooding. Most importantly, plan to spend your time in and outdoors on your Asian vacation. The rainy season can’t ruin trips to museums, palaces and great restaurants.